The Lutheran Study Bible is the first Bible in English to be developed with notes that are distinctively Lutheran. Notes were prepared by theologians and pastors from more than twenty Lutheran church bodies. Current scholarship, insights from Church Fathers, and rich devotional commentary help both new and mature Christians learn about God’s Word. The compact edition features the same content as the regular edition but in a smaller size, so it’s easier to pack or carry wherever you go. It is approximately 5.5" x 7.5" x 1.75" and uses 6-point font (see sample). Weighs 2.3 lbs. For more details and to see samples, visit cph.org/lutheranbible. Printed and manufactured in the United States. 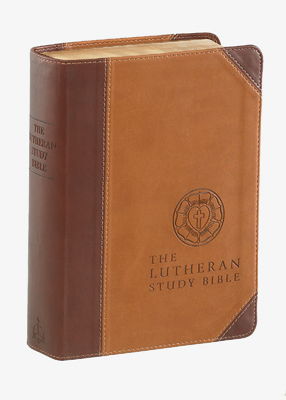 I have several formats (e Bible / standard font and large print) of the Lutheran Study Bible but I wanted one that would be a bit easier to carry with me WHEREVER I went. Because of an earlier review about the font being too small, I hesitated to purchase the compact Bible. However, after looking at the font size on the CPH website, I decided to give it a try. The compact LSB is fantastic! My husband and I both agree that the font is not too small and our eyes are in the 50 - 60+ year old range! It's another excellent version of the Lutheran Study Bible. The font is to small, even with good vision and unfortunately the notations are even smaller. This is too bad b/c it is such a beautiful, high quality Bible. Notations should be 6 pt font and text should be 8-9 pt font to make this practical.